We test for 15 different genetic disorders that affect Labradors! Our dogs have clearances for hips, elbows, heart, patella, eyes PRA-PRCD, PRA-crd4/cord1, GR-PRA2, CNM, DM, HNPK, EIC, SD2, OSD1, Narcolepsy, type IA cystinuria, Elliptocytosis, Hyperuricosuria, X-linked myotubular myopathy, and Pyruvate kinase deficiency of erythrocytes. We have 10 acres in the Central Valley of California (45 miles north of Sacramento). We work from home so we can give our dogs and puppies the time and love they deserve. We have three amazing children that absolutely love our dogs and puppies. We spend every day working hard, playing, tending to our farm, and playing with our dogs and puppies. We have a beautiful creek on our property and our Labs can't get enough of it. Our Labradors are a part of our family. We use “Bio Sensor” AKA “Super Dog” Program to ensure all our puppies are confident, intelligent, happy, and ready to embrace their world with confidence. These exercises have been shown to improve cardio vascular performance (heart rate), stronger heart beats, stronger adrenal glands, greater tolerance to stress, and greater resistance to disease. We have been breeding Labradors for almost ten years. My parents raised and breed Labradors while I was growing up. My parents taught me so many great lessons in life and I am thankful for them every day. One of which is to never become complacent and always do research to make sure the choices we make for our loved ones (dogs included of course) are in their best interest. We have evolved an enormous amount over the last ten years in our breeding program. I’m happy to say we are getting better and more educated every year. I know that our education about all things Labradors will never be finished. There will always be new research and developments that will help us to create better and healthier dogs. 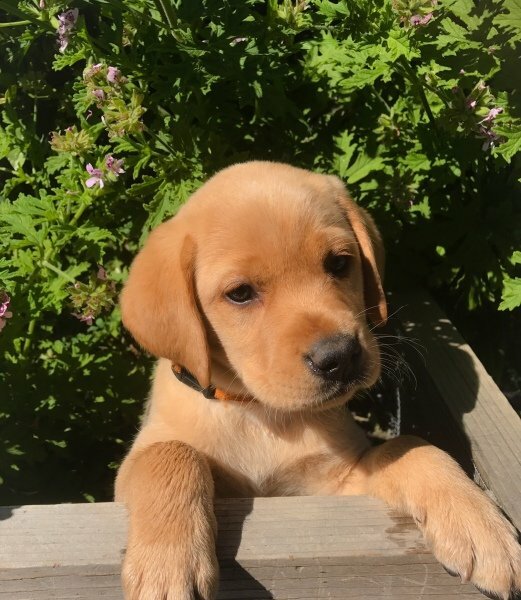 We strongly believe in helping families pick puppies that meet the needs of the whole family, this may include being a service dog, hunting partner, guide dog, family companion, etc.. We want to help insure families get the puppies that meet their needs. In order to help us accomplish this goal, we keep detailed records of the puppies personalities and use the Volhard Puppy Aptitude Test, or PAT. The puppies come with an awesome binder that has all the information you could ever want and need about our fur babies. They also come home with AKC limited registration paperwork (without breeding rights), a food sample, handmade toys, plus so much more! We have a very special puppy package that is truly unique. We spare no expense when it comes to our dogs and puppies. Our puppies come home to you dewormed and up to date on vaccinations. We stand behind the Labradors we help to create. We offer lifetime breeder support and are always available to answer any questions you may have. I'm looking forward to speaking with you. I know you will fall in love, just like we have, with our dogs and puppies. Thank you for your interest in Houston Labradors.